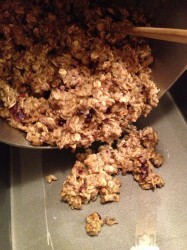 Lately I’ve been in sugar over-load and had to make something healthy that actually tastes good. 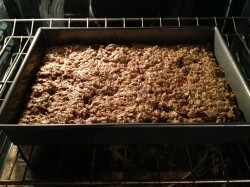 Well let me tell you, these Healthy Homemade Energy Bars fit the bill. They are the perfect afternoon snack that helps get you to dinner without binging on vending machine food at work or the Oreos hiding on the top shelf. 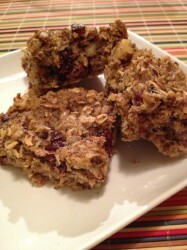 These Healthy Homemade Energy Bars are full of protein, fiber, healthy fat, natural sweetness and packed with flavor. They are pretty easy to make too. 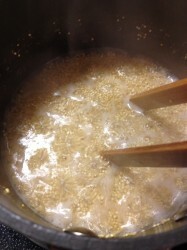 The most difficult part was to cook the quinoa and all that isn’t too bad either. 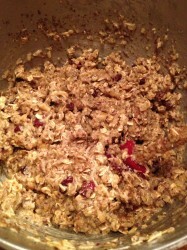 This recipe (adapted from BackPackerRecipes) is a great use of leftover plain quinoa too (made with water of course). Let me show you how to make these Healthy Homemade Energy Bars. 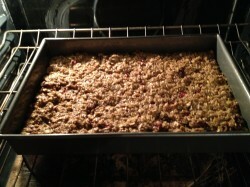 Here are the ingredients: quinoa, (water), rolled oats, flaxseed meal, whey protein powder, baking soda, flour, walnuts, shelled sunflower seeds, craisins (dried cranberries), shredded coconut, salt, oil, honey and vanilla. Spray a 9×13 pan with non-stick cooking spray and set aside. 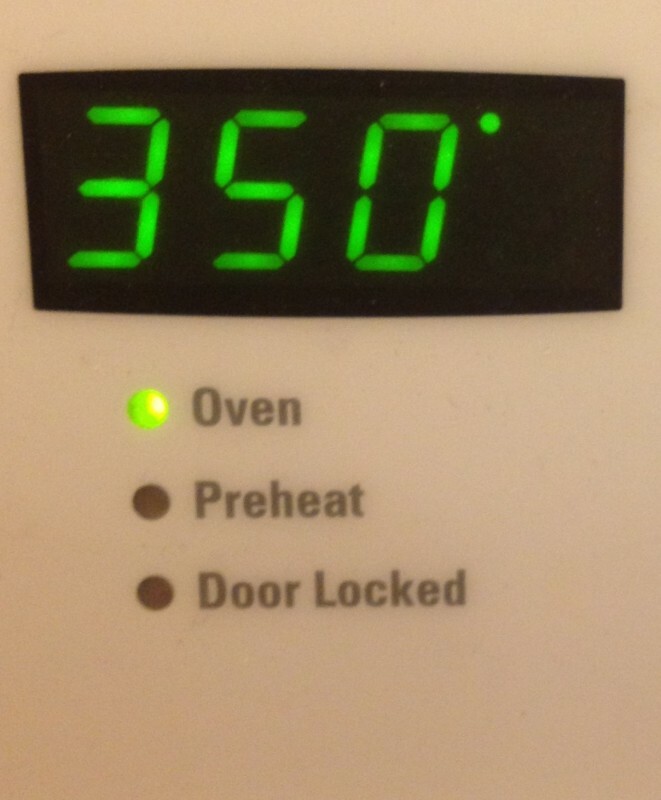 Preheat your oven to 350°F (175°C) and adjust your oven racks to low and middle positions. 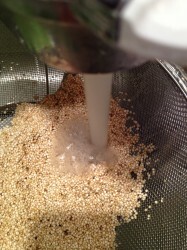 Rinse 1/2 cup dry quinoa under cold water for about 2 minutes. 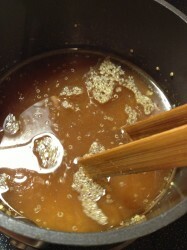 Add your rinsed quinoa to 1 cup water in a medium sauce pan. Bring to boil (takes about 3-5 minutes) and then put a lid on your saucepan to allow to steam-simmer on low-to-medium heat for 20-minutes. 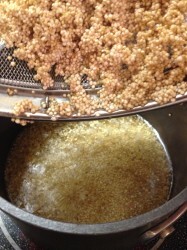 Be sure to check the quinoa to taste the texture of it. 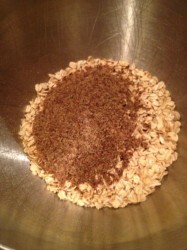 When you are waiting for the quinoa to cook, get the dry ingredients ready. 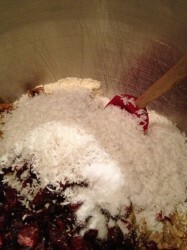 …shredded coconut and salt. 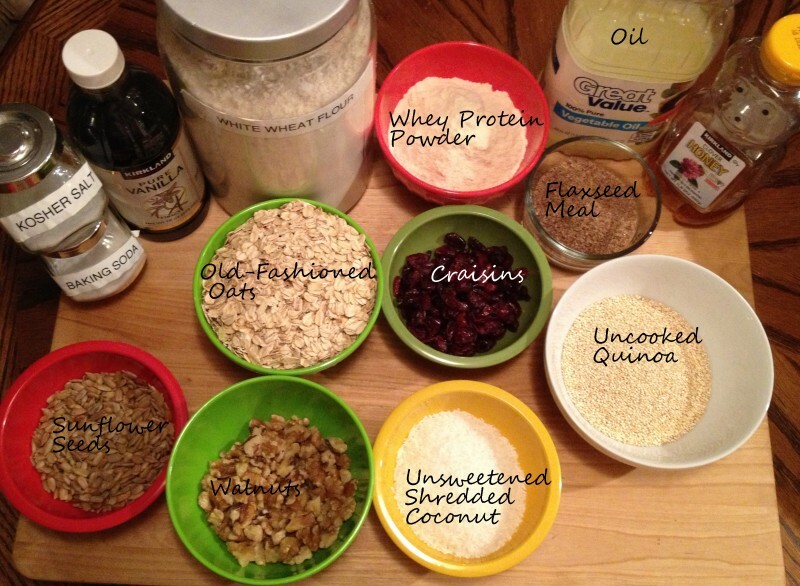 There are a lot of ingredients, but dang are they healthy (and delicious)! 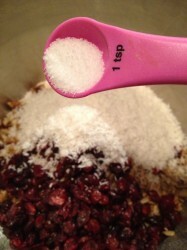 Mix the dry ingredients together with a rubber scraper until they are thoroughly combined. 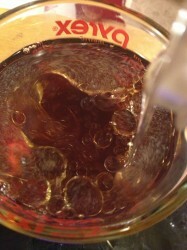 Add the remaining water to a liquid measuring cup and add honey. 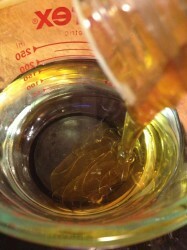 TIP: If you add honey after the water it will have a more difficult time sticking to the measuring cup. 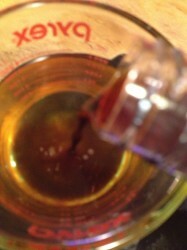 Add the vanilla extract and the oil and set aside. 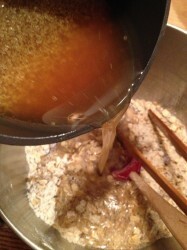 Once your quinoa is cooked, add your liquid ingredients and stir to combine. 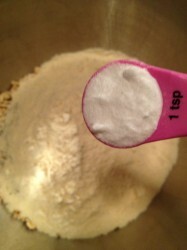 Fold the wet ingredients into the dry ingredients until well combined. 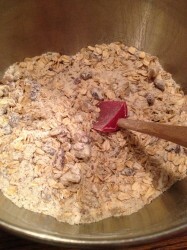 Spread the mixture into your pre-greased 9×13 pan. 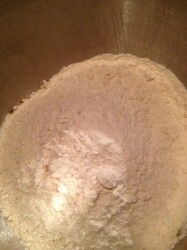 Make sure to press the mixture into the corners of the pan. 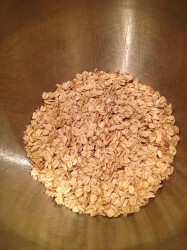 Bake at 350 degrees F (175 degrees C) for 20-22 minutes. 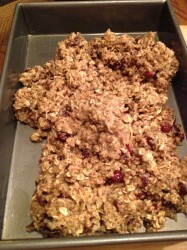 Remove from the oven and allow to cool thoroughly on a cooling rack before cutting into squares. 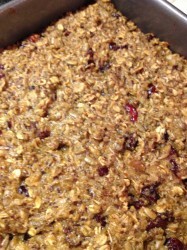 Disclaimer: This nutrition information was calculated on Livestrong.com using the ingredients shown in recipe. 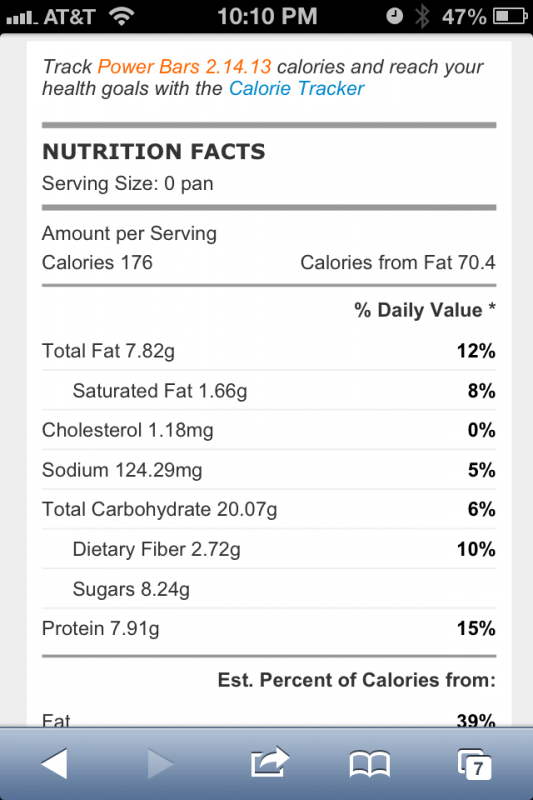 As you can see these bars are a terrific source of good fat, lower in carbs, a good amount of fiber and protein for a homemade bar. And they are delicious too! Don’t they look good? 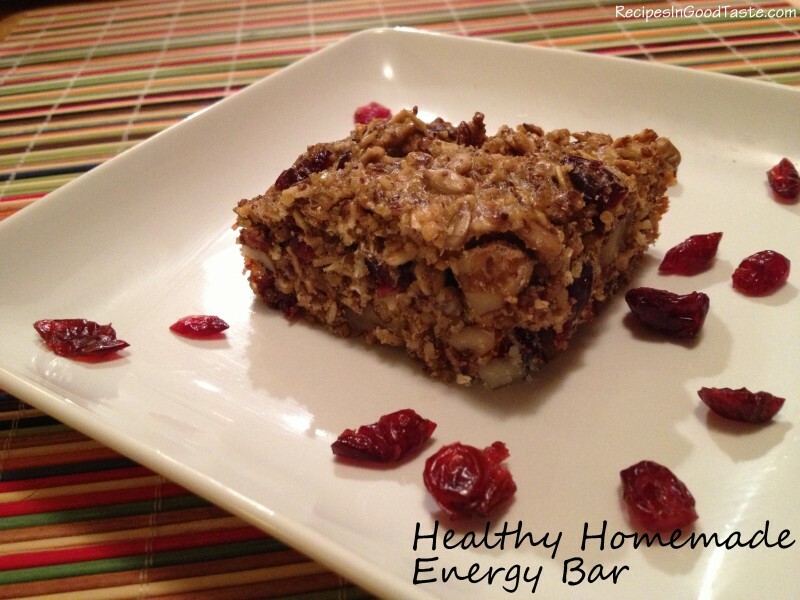 These Healthy Homemade Energy Bars are such a delicious and healthy choice for a snack to get you through a hunger patch. 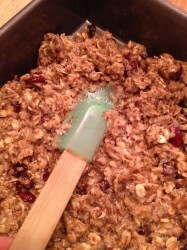 If you try this recipe for Healthy Homemade Energy Bars, please COMMENT below. I want to hear your results! 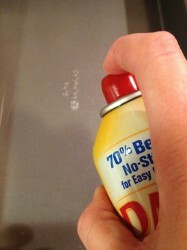 Step 1 Preheat your oven to 350°F (175°C) and spray a 9x13 pan with non-stick cooking spray. Set aside. 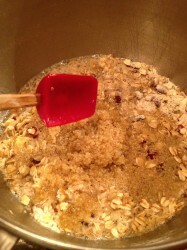 Step 2 Cook quinoa according to package directions (1/2 cup quinoa to 1 cup water). 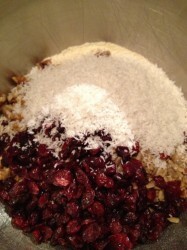 Step 3 Combine oats, flaxseed, protein powder, baking soda, flour, walnuts, sunflower seeds, craisins (dried cranberries), coconut and salt in a large bowl. 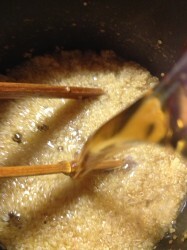 Step 4 Once quinoa is cooked, add the oil, honey vanilla and water to the pot. 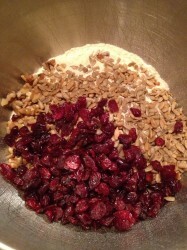 Step 5 Fold the wet ingredients into dry ingredients and mix to combine. 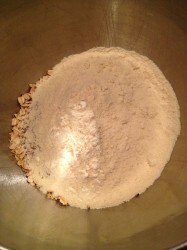 Step 6 Spread mixture into greased 9 x 13-inch pan, pressing down with hands to fit into pan. 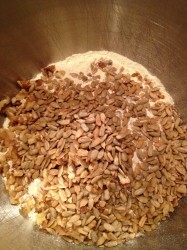 Step 7 Bake for 20-22 minutes at 350ºF. 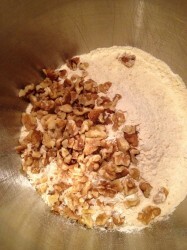 Allow to completely cool and cut into pieces.